Arrival in Catania and self transfer to the hotel. In the evening dinner and overnight in hotel. After breakfast, departure to Mt. 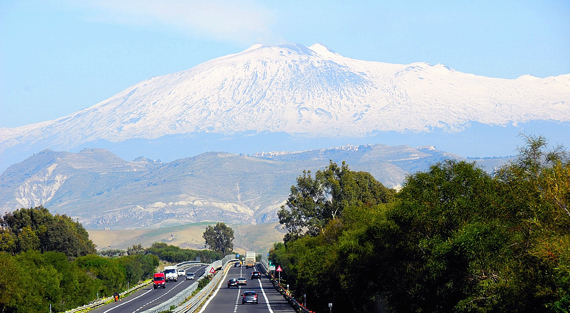 Etna Volcano, the highest active volcano in Europe. We will reach the “Crateri Silvestri”, small volcanic cones now inactive, surrounded by ancient lava flows. Free time for lunch. In the afternoon we will visit Taormina, charming town offering a lovely panorama of the Ionic Sea and Etna, famous for its fascinating Greek theatre, the ancient Cathedral and Palazzo Corvaja. You can take a nice walk among the typical small streets for shopping (coral jewels, precious laces, ceramics, sweets and much more). Back to hotel in Catania for dinner and overnight. After breakfast in hotel we will leave to visit the historical centre of Catania with its original baroque style and its streets built with black lava stone from mount Etna. The walking tour will start across the “pescheria” (the ancient fish market) to reach the Duomo square with its magnificent Cathedral and the famous “Liotru” statue, symbol of the city. Not far from here you could also see the Teatro Massimo Opera House, the University and famous baroque streets such as Via Crociferi. We will continue with the Diocesan Museum, one of the most important museums in Italy, which preserves works of sacred arts coming from the 121 baroque churches in Catania, such as the “fercolo” (carriage) carrying the silver statue of Saint Agatha during the celebration of the famous Feast. The tour will be completed with the visit of Roman “Thermal Bath”. Transfer to Piazza Armerina and free time for lunch. In the afternoon we will admire the splendid polychrome mosaics of the famous Villa Romana del Casale, representing mythological and historical episodes and scenes of hunting and entertainments. We ill proceed with the visit of the “Villa delle Meraviglie”, country residence of a noble family to admire the splendid collections recovered by the family over the years and to see how nobles used to live in 1700. We will proceed to Palermo for overnight. Dinner at the hotel or in a restaurant nearby. After breakfast in hotel, the morning will be spent visiting the capital of Sicily, one of the richest towns in the island for its history and art. We will visit the Cathedral, the Palazzo dei Normanni with its precious Palatine Chapel, the fountain in Pretoria Square, adorned with sculptures. We will proceed to Monreale to visit its huge Norman Cathedral, proclaimed the Eighth Wonder of the World, and its splendid Cloister. Free time for lunch. In the afternoon, departure to Bagheria, to visit Villa Palagonia, a patrician villa famous for the statues of monsters with human faces which decorate its garden and its wall, that make the Villa known as “The Villa of Monsters” (Villa dei Mostri ). Transfer to Valderice for dinner and overnight in hotel. Breakfast in hotel and departure to Erice, a small medieval village of ancient Greek origins, situated on a little hill (Mount St Giuliano), where it is possible to enjoy a fantastic view on the Egadi Islands. Proceed to visit the small island of Mothia, situated at the centre of a large lagoon in Marsala, known today as ‘Stagnone’, dipped among Salines and windmills. Thanks to its particularly favorable location, in the past it was one of the most prosperous Punic colonies in the Mediterranean. To reach Mothia we will go on a boat and across the lagoon we will admire the rests of Phoenician civilization. Free time for lunch. Before leaving Marsala, we will stop to taste typical products. Proceed to Selinunte to visit the largest Archaeological Park in whole Mediterranean: surrounded by a splendid landscape near the African Sea, we will walk among the rests of the ancient Greek city, which today represent the largest archaeological site in the Mediterranean. Transfer to Agrigento. Accommodation in hotel, dinner and overnight. Breakfast in hotel and visit of the Valley of the Temples where, among hundreds of almond trees, the rests of the ancient Akragas rise. It was defined by Pyndar “the most beautiful city of mortals”. 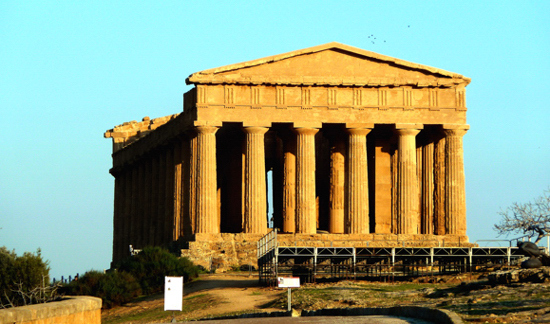 You will see the “Temple of Hera”, the “Temple of Concordia” and the “Temple of Heracles”. Free time for lunch. Departure to Ragusa and visit of the historical centre (Ibla), with its Cathedral, situated in the beautiful square of the Dome. Proceed to Modica where, besides visiting the Church of San Giorgio you may taste the delicious chocolate, typical of this city. Dinner and overnight in hotel in Modica. After breakfast in hotel we will reach Noto, the capital of Sicilian baroque, passing through the countries of Ragusa region. Noto, famous for its fine buildings of the early eighteenth century, is considered one of the main masterpieces in the Sicilian baroque style and the town was declared UNESCO World Heritage Site in 2002. Departure to Siracusa, the most beautiful and greatest Greek colony in Sicily. Free time for lunch. In the afternoon the visit will start with the Archaeological Park of Neapolis, with its Greek Theatre, the Roman Amphitheatre, the Latomie of Paradise and the Dyonisios “Ear”; it will continue with the visit of Ortigia, a small island which is the historical centre of Siracusa. In Ortigia you will admire the beautiful Cathedral and the famous Arethusa’s Fountain. Transfer to Catania for dinner and overnight in hotel. Breakfast in hotel and end of services. Would you like a detailed program? Click here! Transfers to Palermo ad/or Catania airport are available but not included in the tour price, please, do not hesitate to ask us for information. From April 4th trough October 24th guarantee departure every saturday. €770 per person, based on double occupancy. Entrance fees, airfare, airport transfers, international departure taxes and fees, applicable passenger facility charges,insurance and overtime charges for car rentals, items of a personal nature, such as gratuities, drinks of any kind, excess baggage charges, and any charges in excess of those covered by the prepaid package. Package prices are based on tariffs and exchange rates at the time of printing and are subject to change without notice, availability and confirmation. Gabriele’s Travels to Italy is not responsible for typing mistakes and/or tour features descriptions.